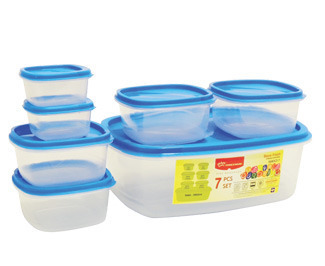 We ensure Plastic Food Storage Boxes in various standard sizes to store food products. These are widely acclaimed for their high quality and long sustainability. Our products are provided to both the commercial and residential clients. They are convenient to use, air tight and are highly reliable. Our standard and advanced products are largely provided at the profitable market price range. Established in the year 1988, Hem Traders incepted in the market as prominent Wholesale, Trader, Distributor and Supplier of Plastic Chairs, Tables and Stools, Baby Products, Food Storage Products, Thermoware Products, Steel Ware Products, Bathware Products, Plastic Fruit and Vegetable Baskets etc. We understand the importance of quality and provide highly strong products which are sourced from the optimum and reliable vendors of the market. With our broad marketing network and huge business exposure, we are able to provide highly strong, reliable, advanced and sustainable products in wide varieties at the leading market price range. Our decent and ethical business policies help us to maintain huge clientele all across the nation.